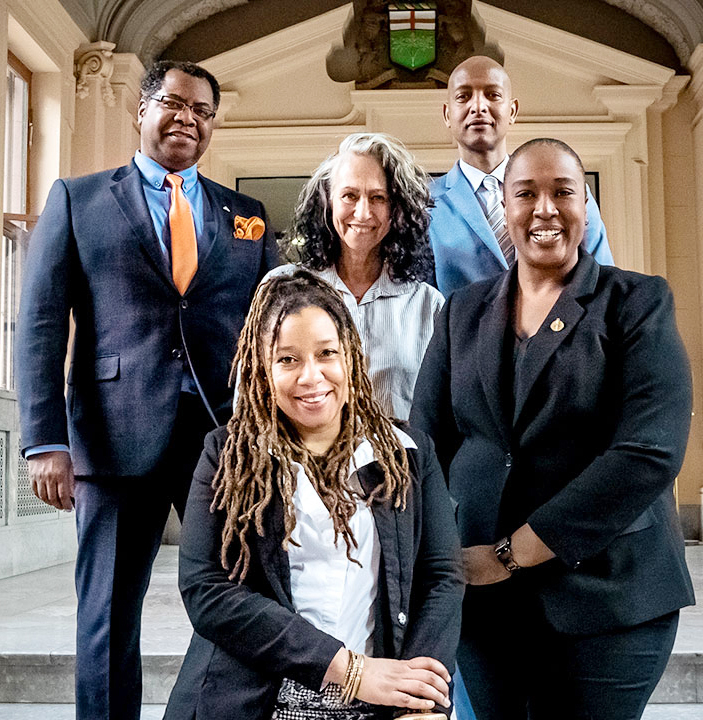 The members of the Ontario NDP's first Black Caucus are Laura Mae Lindo, Rima Berns-McGown, Jill Andrew, Faisal Hassan and Kevin Yarde. Photo: Submitted. Beaches-East York MPP Rima Berns-McGown is thrilled to be a member of the NDP’s history making Black Caucus. The caucus is the first of its kind in Ontario and looks forward to tackling systemic anti-black racism in every area of public policy in Ontario. McGown said this is something the community requested. As a biracial Ontarian who was born in South Africa, she wants to push the envelope on public conversations on what it means to be mixed in Ontario. She mentioned how her personal family history and experience have been affected by anti-black racism. She said she is enthusiastic to make systemic change to ensure that the province works for all identities. “As the Critic for Poverty and Homelessness, I am very aware of the ways in which anti-black racism fuels the systems that push black people into and keep them in poverty – and I am excited to work actively to counter those systems,” McGown said. This is a first in Ontario’s history. The partnership between the NDP and the black community is a way to cultivate relationship and representation. Ontario NDP leader Andrea Horwath said she was proud to announce the formation of the Black Caucus. “Black community members should see themselves represented and respected when they look at their government. Black Canadian leaders must be at the table when every decision is made. That’s why I’m so proud to announce the formal creation of the Ontario NDP’s Black Caucus, chaired by our Anti-Racism Critic and MPP for Kitchener Centre, Laura Mae Lindo,” said Horwath in a press release. Other members of the NDP’s Black Caucus are York South-Weston MPP Faisal Hassan; Toronto – St. Paul’s MPP Dr. Jill Andrew; and Brampton North MPP Kevin Yarde.